Did you know that September 25 is National Lobster Day? What better day to celebrate the sweet, succulent flavor of luscious lobster than by enjoying a night out at Bottiglia Cucina & Enoteca? Here, we’re celebrating this stellar shellfish with a post featuring important news about our National Lobster Day special and spotlighting some fascinating facts about lobster, which will make perfect conversation over dinner! 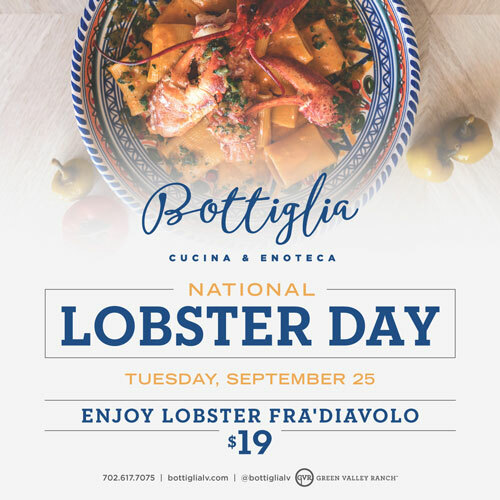 National Lobster Day at Bottiglia: a special offer! On Tuesday, September 25, we’re celebrating National Lobster Day in style by offering our memorable Lobster Fra’ Diavolo entree for just $19! Now, in case you’re not in the know, Lobster Fra’ Diavolo is a classic Italian seafood dish featuring lobster and a spicy sauce made with cherry pepper and lobster cream sauce, which is all served atop a bed of pasta. Of course, it’s even better with wine! Per a recent post about pairing Bottiglia’s pasta entrees with wine, this dish is even tastier when paired with a dry white wine such as Pinot Grigio or a sparkling wine. Ready to have your mind blown? 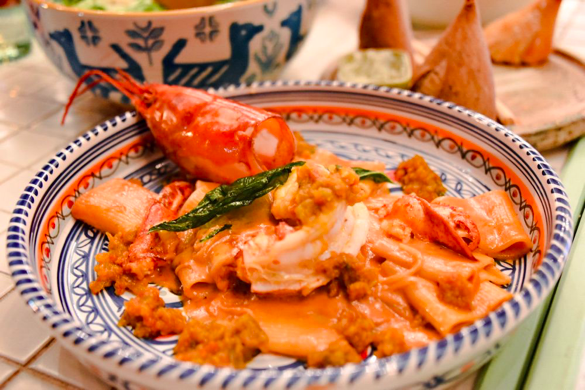 Here are some fascinating facts about lobster to discuss over your Fra’ Diavolo at Bottiglia! 1. There’s more than one Lobster Day! Depending on who you ask, the best day to celebrate lobster may be in June or in September. If you browse around the internet, you’ll find that June 15 is recognized as National Lobster Day…but then again, so is September 25th, which was officially designated National Lobster Day by the Senate in 2015. Too confusing? Here’s our advice: celebrate both! 2. Lobsters live a really, really long time. No fooling: it’s possible for lobsters to live for 100 years or more. 3. Lobster hasn’t always been a fancy food. Today, lobster is pretty established as a celebratory delicacy. However, this wasn’t always the case. In Colonial times, lobster was so ubiquitous in the Northeast US that they were actually used as farm animal feed and as fishing bait. Our appreciation of lobster has evolved over the years; now, it’s beloved by foodies and is right at home next to gourmet entrees on many a menu. At Bottiglia, it’s featured in both our Lobster Fra’ Diavolo and in our Grand Shellfish Tower, a luxe appetizer featuring shrimp, lobster, oysters, and crab. 4. Lobster is high in protein. If you’re trying to up your protein consumption, you can consider lobster an A+ source. A one-cup serving of lobster supplies 28 grams of protein. It’s also naturally low in fat. 5. Lobsters aren’t red until cooked. When you think of lobster, you probably think about its candy-red color. But this isn’t how it looks in the wild. In the ocean, most lobsters will have a greenish-brown color. They actually don’t turn red until cooked. The heat breaks an important bond between protein and pigmentation in the shell. The red color is thanks to a little something called astaxanthin, which is a type of pigment found in plants that the lobster eats. 6. That’s a big lobster! The world’s largest recorded lobster catch weighed in at a whopping 44 pounds. It was caught off of the coast of Nova Scotia in 1977. To put that into perspective, 44 pounds is an average weight for an approximately 5 year old child. Yes, that’s a massive lobster! 7. How much lobster is caught per year? A lot more than you might think, and it’s a big business! 8. Nobody knows where Lobster Fra’ Diavolo’s name comes from. “Fra’ Diavolo” roughly translates as “devil monk” from Italian, referring to its sweet-fiery flavor, which features a tomato sauce with tongue-tingling spices. However, nobody knows exactly why the dish has this funny name, which also happens to be the nickname of an Italian bandit from the late 18th century. Even as far back as 1996, The New York Times mused that the reason behind the pasta dish name “bedevils the experts”. At Bottiglia Cucina & Enoteca, we are serious about offering the best Italian cuisine in Henderson. We hope that you’ll join us in celebrating National Lobster Day on September 25th by enjoying our Lobster Fra’ Diavolo special and one of our delicious cocktails or wine offerings! 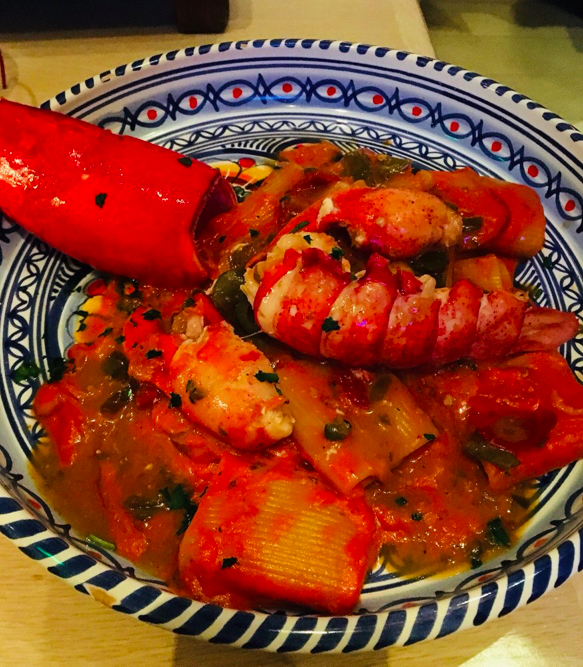 Have you ever tried Lobster Fra’ Diavolo?